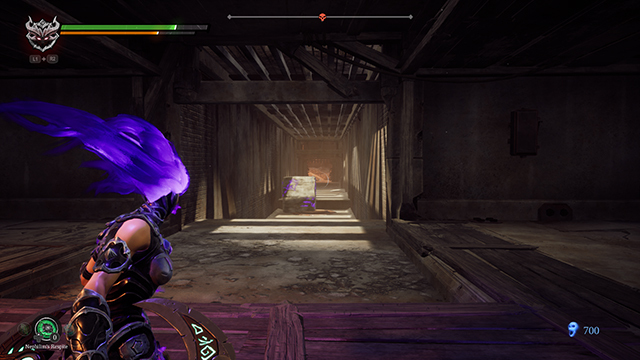 Darksiders 3 does not have that many puzzles and the few that are there are pretty easy. Except one. 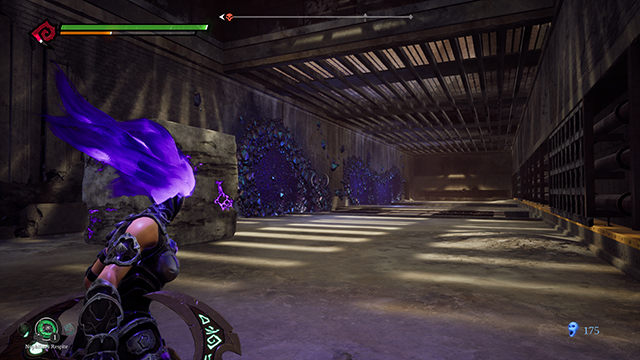 The Darksiders 3 tornado puzzle is a bit obtuse and can take multiple tries to figure out. 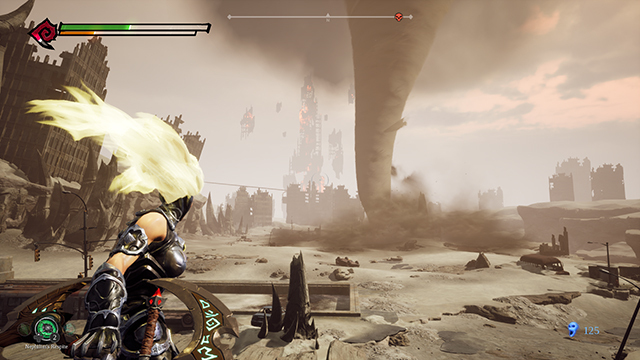 In case you’re stuck, here is how to figure out the first and second Darksiders 3 tornado puzzle. 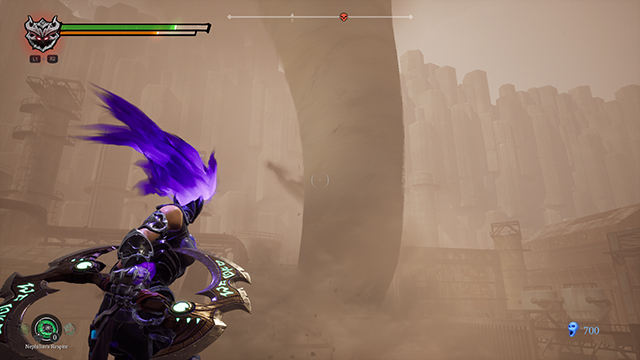 You might even be having trouble getting to the tornado in Darksiders 3. You need to know that it sort of tracks you and you have to be aware of that when first gliding to the island. Be sure to time your descent to when you see the tornado as far away as possible. Then glide over and use the sprint button to get to safe haven in the subway tunnel on the right. The timing is super tight so don’t get discouraged even if it seems impossible. Do not worry about collectibles around the tornado either because you’ll be able to safely get them once the storm is gone. Again, keep in mind that the tornado tracks you so it won’t go on its own independent route. It will be skewed by where you are if you’re in a certain area. So if you wait back, the tornado won’t pick up the blocks and only will if you are in the specific “danger zone.” Also keep your Force Hollow (purple hair) on so you don’t get sucked up into the tornado. The first step is to smash the purple wall to your left near the back of the room. Run into that room and you’ll see a slit peering out to the out to the rest of the room. The tornado should have dropped the block in front of you (you should be facing west). Hit the block through the slot with your Force Hollow hammer. This will send the block in the pit. 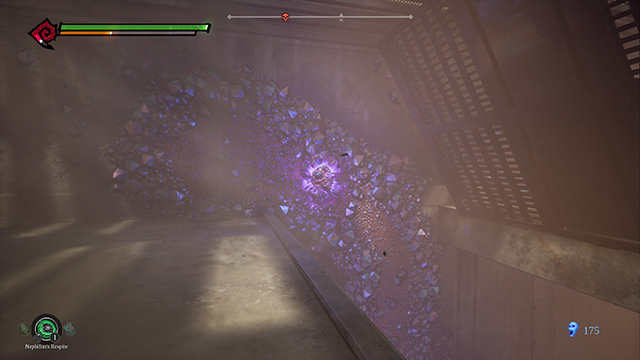 Rush down into the pit and hit that purple cube with your hammer to the west side of the room. Then use your Force Hollow power by hitting and holding the jump button to stick to the wall shown in the picture below. The tornado should have caught up to you by now. It will bring the block up (as it also moves the grate with holes in it) as your use the magnet wall to get back to the top area. Now you must walk toward the entrance of the room (the west side). Since the tornado tracks you, it will have dropped the block right in front of you on the west side of the room. Wait a few seconds then rush back over to the block and hit it to the side of the room you came in to use it as a ledge to get out of there. The second one is a bit trickier and, to be frank, more obtuse. Hit the block with the hammer and get on the north side of the hallway. Wait a bit for the tornado to pick the block up to drag it to the north end of the room and then wait a bit for the tornado to “go away.” Then quickly hit the block with your hammer to the south to get it on the button on the floor (as shown in the picture). Run towards it and then switch to your Stasis Hollow (the blue one) and throw your Salvation (the disc thing) at the block with your stasis charge on it to keep it from being lifted up by the tornado. Then, again, switch back to your Force Hollow and sprint to the door to the south. Remember that you have to hold down the fire button to get your stasis effect on the blade to freeze the block. Freezing the block on the button keeps it from getting lifted by the tornado. In essence, hit the block with the hammer, freeze it with your frozen stasis bladed frisbee, switch back to your purple hair, and then sprint to the exit. 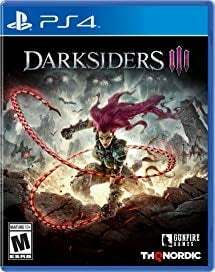 After this, the Darksiders 3 tornado will not be a nuisance anymore since you’ll be able to “kill” it in the next area.